The perfect dinner for the whole family! For the curried mince, heat the olive oil in a medium pot over medium heat. Add the chopped onion and fry until soft and translucent, 5 minutes. Add the crushed garlic and grated ginger. Sauté until fragrant, about 5 minutes. Add the curry powder and fry off for another minute. Add the beef mince and cook, about 15 minutes. Stir in the sultanas and chutney. Season to taste. Remove from heat and set aside. Heat the rotis in a dry pan over medium heat until crispy, about 1 minute per side. Remove from heat. Set aside until needed. Divide the curried mince among 4 ramekins. Top with the toasted almond flakes. 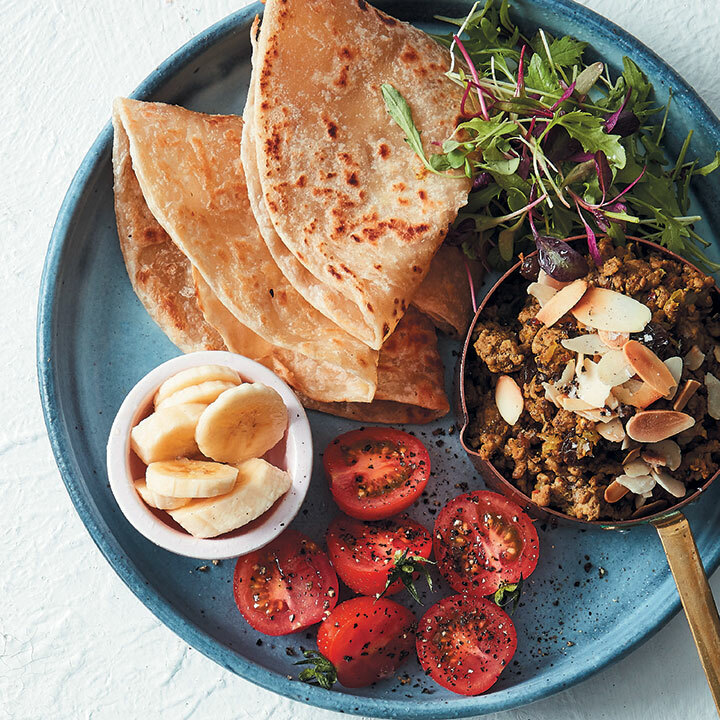 Serve with the crispy rotis, banana slices, tomato halves and microherbs alongside.